Much like authentication, Spinnaker allows for a variety of pluggable authorization mechanisms. This page shows how to setup and configure Fiat, Spinnaker’s authorization microservice. Fiat’s authorization model is a whitelist that is open by default. In other words, when a resource does not define who is allowed to access it, it is considered unrestricted. Restrict access to specific accounts. Restrict access to specific applications. 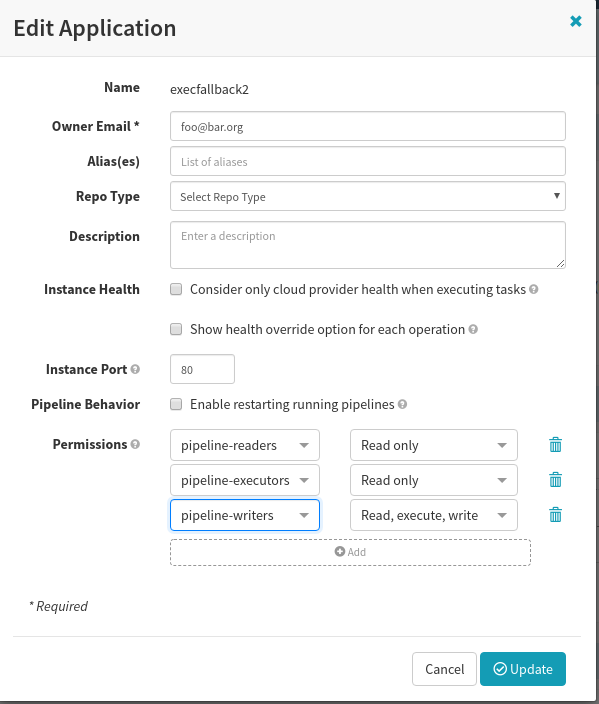 Run pipelines using automated triggers against access-controlled applications. Use and periodically update user roles from a backing role provider. Authentication successfully setup in Gate. Configured Front50 to use S3 or Google Cloud Storage (GCS) as the backing storage mechanism for persistent application configurations. SAML roles are fixed at login time, and cannot be changed until the user needs to reauthenticate. Patience—there are a lot of small details that must be just right with anything related to authentication and authorization. Accounts and applications access control can be confusing unless you understand the core relationship: accounts can contain multiple applications, and applications can span multiple accounts. In the dark ages (before Fiat), only accounts could be restricted. Because Clouddriver is the source of truth for accounts, Fiat reaches out to Clouddriver to gather the list of available accounts. There are two types of access restrictions to an account, READ and WRITE. Users must have at least one READ permission of an account to view the account’s cloud resources, and at least one WRITE permission to make changes to the resources. These halyard commands manage the READ and WRITE permissions. # Alternatively, you can overwrite the whole read or write list, comma delimited. (Deprecated) requiredGroupMembership is the old way to add access restrictions to an account. This method does not distinguish between READ and WRITE - users with access will have both. It’s important to understand what may happen if you leave either an account or application without any configured permissions. If an account is unrestricted, any user with access to Spinnaker can deploy a new application to that account. If an application is unrestricted, any user with access to Spinnaker can deploy that application into a different account. They may also be able to see basic information like instance names and counts within server groups.